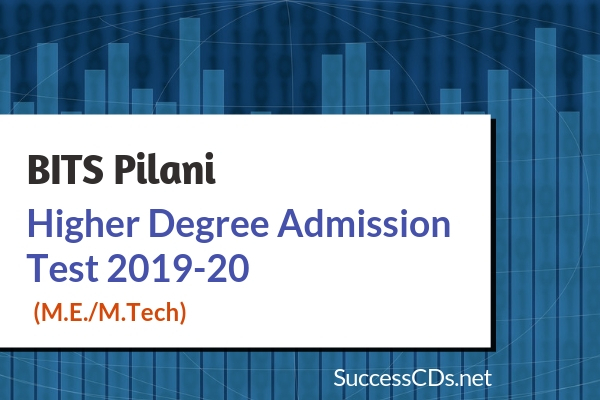 BITS Pilani Higher Degree ME M.Pharm Admission Test 2019 - BITS, Pilani invites applications for admission to Higher Degree (HD) Programs BITS ME /M.Pharm for academic year 2019-20 at Pilani Campus, Goa Campus and Hyderabad Campus. Admissions to all the Higher Degree Programs of BITS, Pilani, at its Pilani Campus, Goa Campus and Hyderabad Campus for the I Semester 2019-20 will be made on the basis of a Computer based Online Test conducted by BITS, Pilani followed by interview(s) of shortlisted candidates. Interested candidates can read the complete information on BITS ME & M.Pharm Admission 2019 such as application form, eligibility criteria, application fee, etc. on this page. A minimum aggregate of 60% in the qualifying degree examination for All Programs. See for Program wise eligibility. Consideration for admission only on the basis of GATE/GPAT score (Scores of GATE 2019 or GATE 2018 or GATE 2017 will be only considered to admissions to M.E. Programs. Similarly scores of GPAT 2019 or GPAT 2018 or GPAT 2017 will only be considered to admissions to M.Pharm. Programs). Candidates must however ensure that their GATE/GPAT scores are valid to be considered for admission. This validity as mentioned on the GATE / GPAT scorecard must be mentioned in the application form. Admission committee will announce a cut-off score in each category, based on the applications received and the seats available. Details of the Software System BITS HD test are given in Annexure III. Admissions will be made on the basis of merit position of students in the Software System BITS HD test. Admissions to all higher degree Programs are based on the performance of the candidates in the computer based online test conducted by BITS test will be a Computer Based Online Test conducted by BITS Pilani at dedicated centers at different cities of India. Computer based online test means the candidate sits in front of a Computer and the Questions are presented on the Computer Monitor and the candidate submits the answers though the use of Keyboard & Mouse; each computer is connected to a server, which prepares the question set and delivers it to the candidate on the computer. Hard copy of Application form is not required to be sent. However, candidates are advised to take a printout of the filled-in form and keep a copy with them for further reference. Candidates shortlisted for the M.Phil. Program will be announced on 3rd June. The test and interview for these candidates will be on 19th July and admission offers will be made on 20th July. Details of fee structure for 2019-20 and related modes of payment will be made available on www.bitsadmission.com/hd in the coming days. Candidates must look up the website for information pertaining to fees and regular updates pertaining to HD admissions for 2019-20.